Whether you consider yourself a new or advanced gardener, time is a spell which we wait for the fruits to come to fruition and plant seeds to grow. 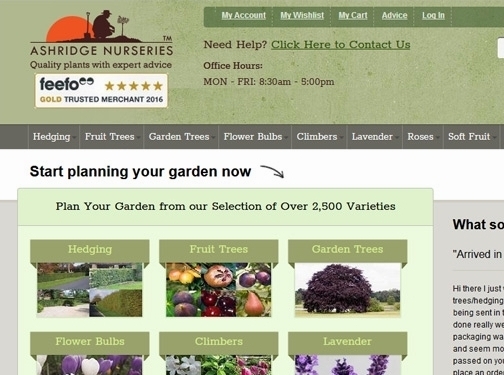 Ashridge Nurseries is trusted by over 100,000 UK gardeners with secure online shopping and with both delivery and plant guarantee. When shopping for gardening supplies, it's important to consider the landscape which is why we offer a variety of products including hedging (be it Beech, Box, Formal, Holly or Hawthorn) along with fruit trees, climbers, lavender, flowers, herbs and other seeds. UK (Somerset) based business - established in 1949 - providing a wide range of gardening/nursery products. Website includes e-commerce facilities, delivery and returns information (via terms and conditions), full contact details including company registration and VAT numbers.